Illinois Gov. J.B. Pritzker has been pitching his graduated income tax as a way to cut property taxes, but there will be little to no relief without a plan to fix public employee pensions and health insurance. Illinoisans pay the second-highest property taxes in the nation. Pritzker correctly sees a need for property tax relief. However, the governor’s plan for a progressive state income tax does nothing to address some of the biggest cost drivers for both state and local governments: pensions and government worker health insurance. 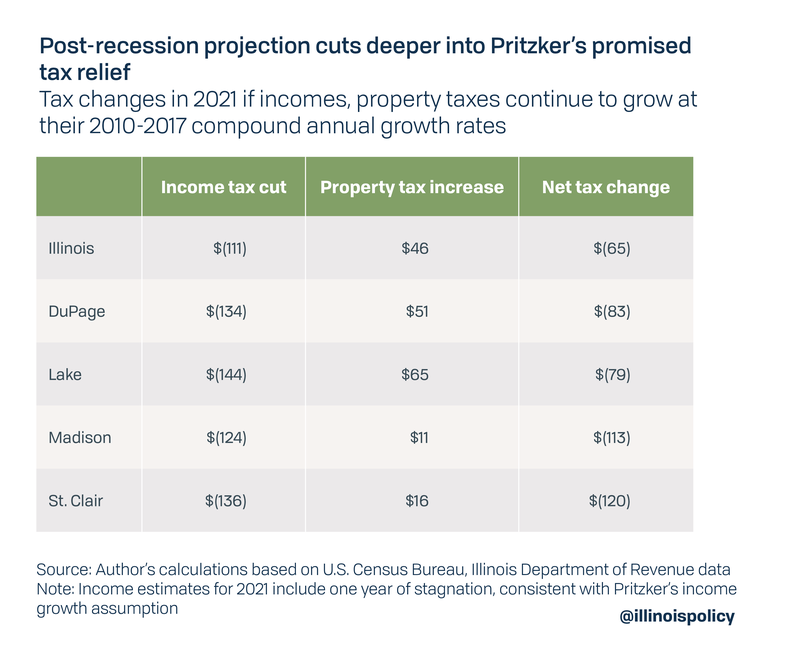 Without reforms to those costs, property taxes are likely to continue rising and Illinoisans will see little to no tax relief from Pritzker’s plan. The governor has proposed using some of the anticipated revenues from his graduated income tax plan to transfer additional state money to local governments through the Local Government Distributive Fund. However, even if all of this money went toward residential property tax relief – an unlikely scenario – these additional funds would not be enough to offset the annual increases in residential property taxes, and it is likely total residential property taxes will increase $200 million to $860 million. 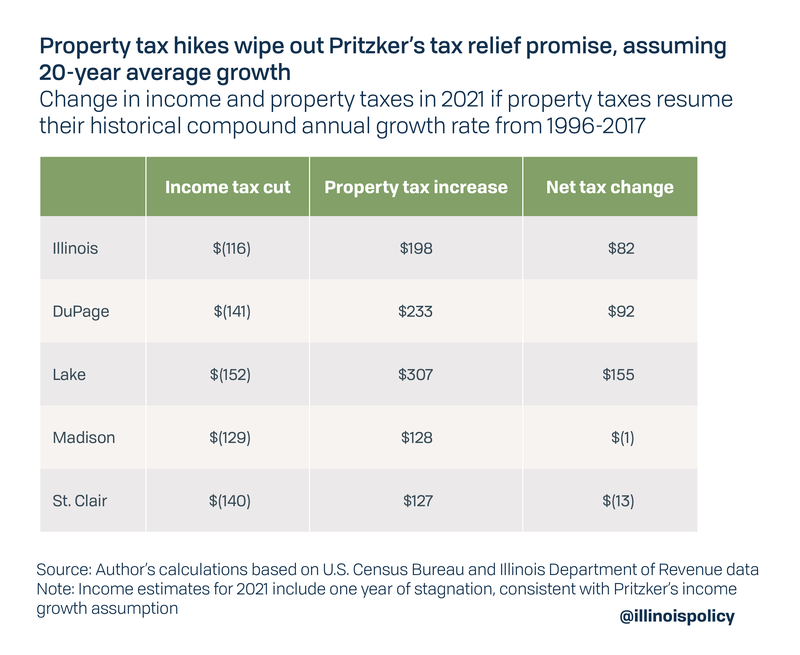 If property taxes continue to rise at their post-recession average, the net tax relief of Pritzker’s plan would be $65 for the median married family. A family making the median married family income – projected to be $102,505 in 2021 – would receive an income tax cut of $111 according to Pritzker’s proposed plan. However, the median property tax bill can be expected to rise by $46 that year. 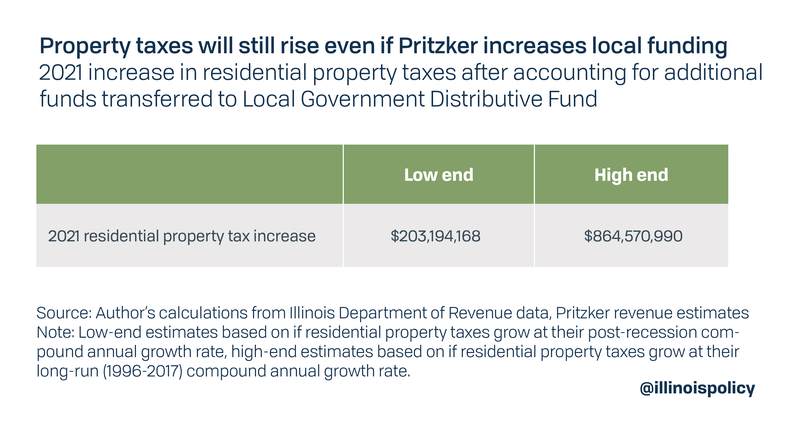 This tax relief would be temporary, as the growth in property taxes will eventually eat any income tax cut from Pritzker’s plan. In a more likely scenario, if property taxes resume their average long-run growth, which is more than double the recent rate at which residential property tax extensions have grown, the median married family in Illinois would see an $82 hike in their combined income and property tax burden. In some areas, such as Lake County, the median married couple would see a net tax increase of $155. The small relief in the first year for Madison and St. Clair counties would be short, as the growth in property taxes would quickly consume their income tax cut. These estimates also assume that Pritzker’s proposed rate structure won’t change, despite the governor’s promises that the progressive income tax would be able to close the budget deficit ($3.3 billion), pay off the bill backlog ($8 billion), solve the state’s pension crisis ($134 billion) and pay for billions in additional spending. If the governor is serious about using the progressive income tax to tackle Illinois’ debt and raise spending for new and expanded programs, annual spending would increase by up to $19 billion and taxes would likely have to be hiked on all Illinoisans, with the median income family facing a $3,500 tax hike. Instead of turning to taxpayers for more money, the governor should push for structural reforms to the state’s largest cost drivers. Without those reforms, a progressive income tax will not provide property tax relief, and will lead to even higher middle-class income taxes.